Kiddiewinkles Children's Toy Storage Basket Large Multi-Striped Pink. 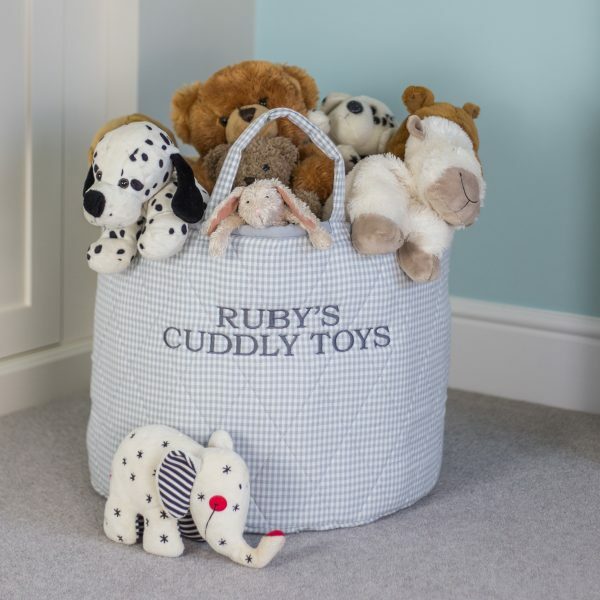 If you are ordering a personalised toy basket please specify the name / phrase you would like embroidered. 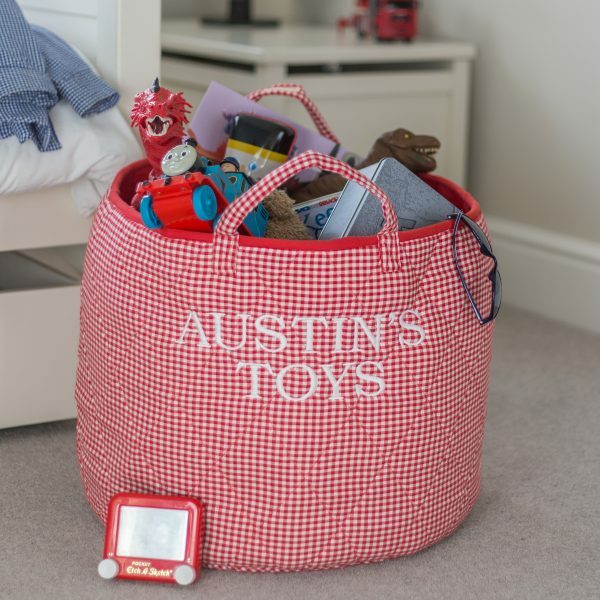 Choose a toy basket and laundry basket and save 10% off standard prices. To make the toy basket extra special for an extra £15 it can be personalised with a phrase / name of your choice. Our range of cotton quilted children’s toy storage baskets are stylish, practical and a great size. They are large enough to keep things tidy and clutter free and look at home in many rooms including nurseries, bedrooms, bathrooms and playrooms. 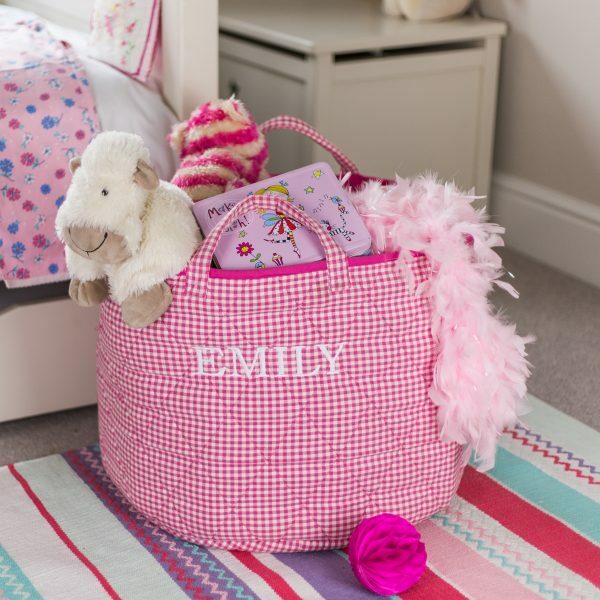 Most of all, soft flexible edges make them perfect for storing all sorts of items such as, unusually shaped toys, cuddly toys, towels, bedding and most other belongings. Make them extra special by personalising with a name or phrase of your choice. The phrase will be beautifully embroidered onto one side of the toy basket. For example JACK, JACK’S BITS ‘N’ BOBS, JACKS’ TOYS, JACK’S CUDDLY TOYS. 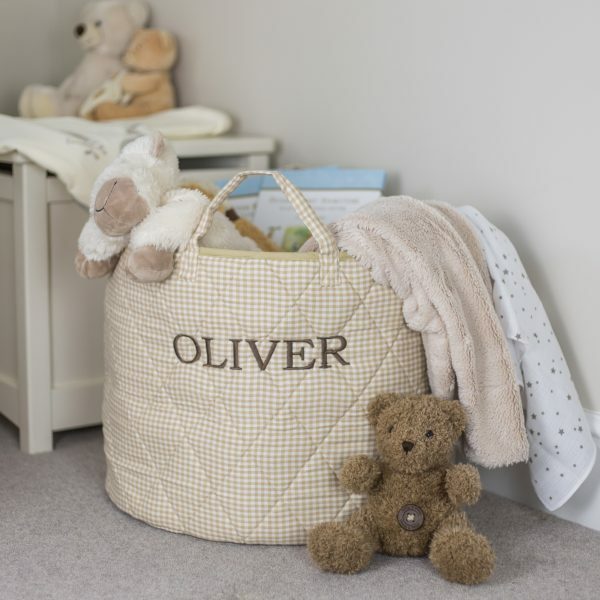 Toy storage baskets make lovely gifts for newborns, Christenings and birthdays. 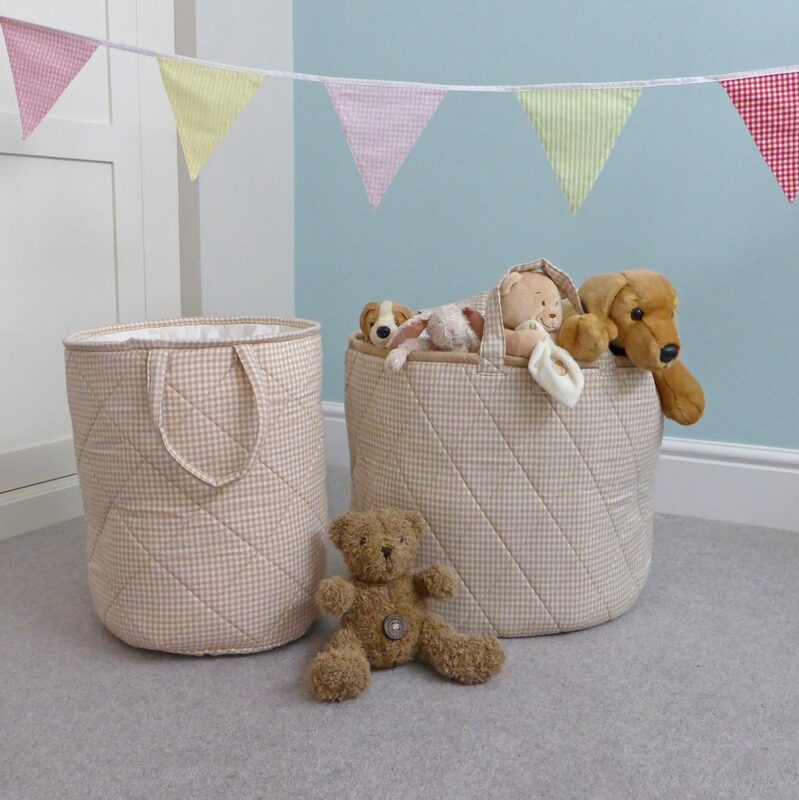 Stylish yet practical quilted cotton children’s laundry basket ideal for nurseries, bedrooms, playrooms or bathrooms. Keeps laundry piles neat and tidy and dirty washing hidden away. Don’t just confine it to laundry though! Perfect to store all sorts of items such as, cuddly toys, spare towels, spare bedding and other belongings. 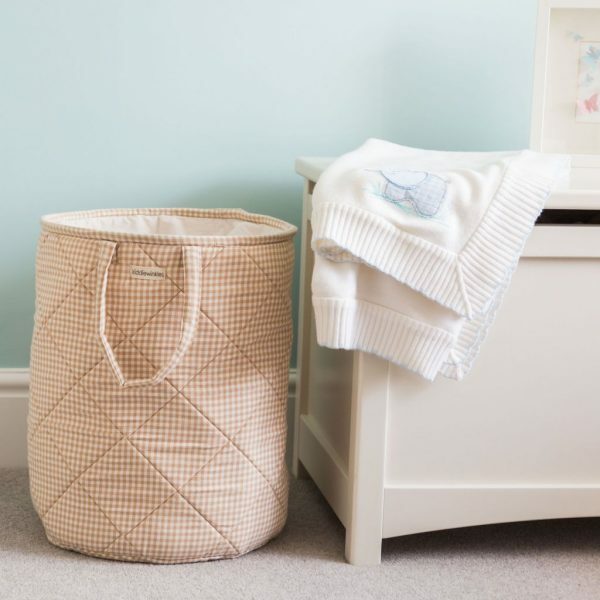 The top of the laundry basket features a wire hoop to ensure the circular shape is retained. A white cotton fabric covers the opening and can be closed with the draw strings to conceal what’s inside! The waterproof lining adds a level of practicality as it can easily be wiped clean. 2 strong handles for easy transportation. The quilted fabric gives them a really premium feel. 100% cotton – spot clean with a damp cloth or machine wash at 30 degrees C.
Available in a range of star and gingham colours. 2 generous sized pockets in our exclusive grey star fabric (pockets measure 25cm wide x 20cm high). The quilted fabric gives it a really premium feel. 100% cotton – spot clean with a damp cloth. Available in navy blue, red or pink star. 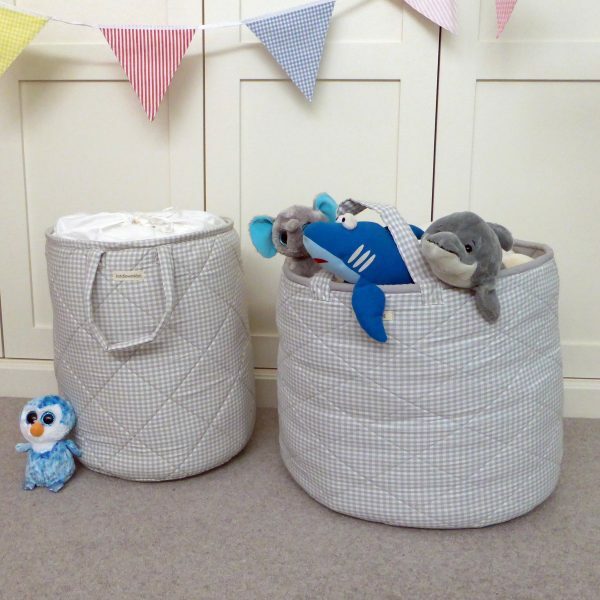 Toy Baskets: 50cm diameter x 40cm high. Bedside Organisers: 2 pockets measure 25cm wide x 20cm high. Non-personalised products are dispatched on a 2 day courier service. We typically turn personalised orders around within 2-5 working days. International delivery is available for all products. Please see our International Shipping Rates here. Our Returns Policy: We will be happy to exchange the item for a replacement or to make a refund which will go onto the card which was used when you made your purchase. We are not able to refund any postage charges but we will send any exchange items free of postage charges. You have a right to cancel your order within 14 days of receiving your purchase. This 14 day period begins the day after you receive the items from us. Please notify us in writing within 14 days that you wish to cancel your order and that you intend to return the item(s ) and we will be happy to offer you a full refund. Please ensure you return the item(s) to us within 14 after cancellation. Please provide proof of purchase when returning an item. If you are unable to provide proof of purchase, an exchange or gift voucher to the value of the lowest-selling price for the returned goods will be offered. A refund will be offered regardless if the goods are faulty. Personalised products are excluded from our returns policy and can’t be exchanged, returned or refunded unless faulty. Please let us know what you are returning and why, and whether you want a refund or exchange for another product. Please make sure your items are securely wrapped and returned at your own cost (unless faulty). We strongly recommend you obtain a free certificate of postage from the Post Office as we are responsible for your parcel only once it has been received into our warehouse. Items lost in transit will not be treated as returned. What if the item is faulty? We are always very disappointed on the rare occasions our customers receive a faulty item. If you have identified the fault within 30 days of purchase, then you can return the item under our normal return procedure for exchange or refund. Make sure you let us know about the fault so we can make sure other items are not affected. We will refund any postage on a faulty item, and ensure you are reimbursed for standard return postage on the item. If it is more convenient for you, we can arrange to have the faulty item collected free of charge within the UK mainland. If a fault develops outside of the 30 day return period, or the item is difficult to package and return, contact us on 01625 449030 or by email to sales@kiddiewinkles.co.uk before you return the item so we can discuss the fault with you and agree the best way forward. We cannot accept an item returned as faulty if the appropriate product care instructions have not been followed and the damage caused to the product is clearly due to wear and tear or misuse. Please provide proof of purchase when returning an item. How do I arrange an exchange? If the product you require is still available we will exchange it for you. If the new item you require costs less than the one you have returned we will refund you the difference. If it costs more than the one you have returned we will need to take an additional payment from you before we can send you the item. Please make sure you give us a daytime telephone number or your email address so we can contact you.Please provide proof of purchase when exchanging an item. If you are unable to provide proof of purchase, an exchange or gift voucher to the value of the lowest-selling price for the returned goods will be offered. Sign up to our newsletter and keep up-to-date with our creative ideas for things to do with your Kiddiewinkles, child friendly recipes, special offers and more.